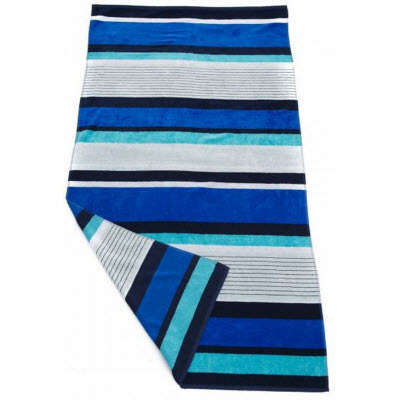 Extra Large striped Velour Jacquard Beach towel in 2 bright colour ways. 100 x 180cm 430gm2 Perfect for Embroidery or Photo Materials: 100% cotton velour. Item Size: 100 x 180cm. Packaging: single poly bag. Colours: Ocean | Sunshine. Decoration Options Available: Embroidery | Photo. Price includes: See dropdown menu for decoration options.